On / off button.Floss-Tip? * Experience deep cleaning power and a healthy whole mouth clean: Floss-Tip? * Bristles provide 4x deeper reach below the gumline** On / Off Button Cleaning power of 20.000 strokes/minute. Tongue and cheek cleaner *This brush does not replace flossing. **Below the gumline compared to an ordinary flat-trim toothbrush. A healthier mouth means a more confident smile, and that's exactly what you'll enjoy with the Colgate® 360° Surround Sonic Power Toothbrush. 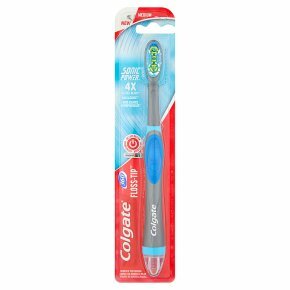 Combining the all-round cleaning of surround bristles, the power of 20,000 strokes a minute, and a wraparound cheek and tongue cleaner, this toothbrush gives you whole mouth freshness. Dentists and hygienists recommend replacing your toothbrush refill every 3 months. WARNING: Battery choke hazard. Do not charge battery or put in fire.<br>May explode or leak causing injury.<br><br>Dispose of product separately from household waste. Always remove battery before discarding. Return to designated waste collection point for electrical equipment and batteries.